Yesware, a startup that helps track email and improve productivity for salespeople, has raised $1 million in funding from Google Ventures, Foundry Group and other investors. Yesware is a suite of productivity services that work where salespeople do – in their email and on their phones. The application is available for Gmail and smartphones and provides email analytics, customizable templates and CRM integration to help salespeople close more deals faster. Yesware works in conjunction with a number of popular CRM platforms including Salesforce.com, Microsoft Dynamics, Oracle CRM, Highrise and others. Yesware includes customizable email templates for every stage of the sales process, from prospecting to closing the deal; automatic synchronization between smail and CRM Systems; activity-cased reporting to provides objective metrics on how individual salespeople build rapport with customers, and email tracking. The application’s racking features report on the time, number of times, location and platform that the recipient opens an email. Yesware will prioritize email conversations by customer engagement so salespeople can spend more time with interested prospects. The application also comes with a companion Android app. As Matthew Bellows, CEO and founder of Yesware tells us, the beauty of the application is that it provides both an intelligence and productivity layer on top of Gmail and CRM products. 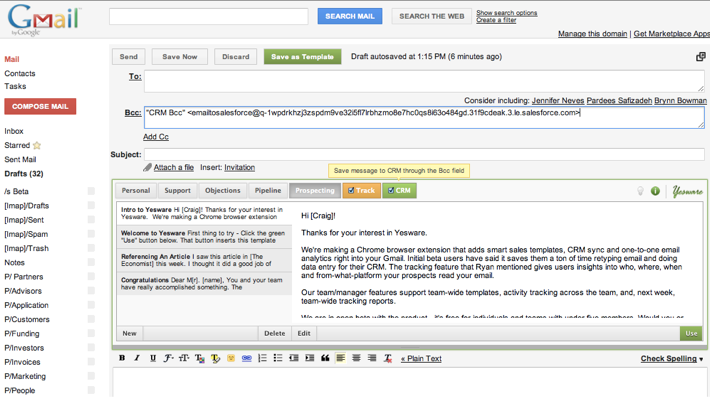 Yesware for Gmail is free to individual salespeople and available for sales teams, on a per-seat subscription basis. Yesware for Android is available for a one-time purchase price of $4.99 via the Android Market. The company’s customers include KissMetrics, StackOverflow and others. The new funding will be used towards product development.